Stems 2 to 5 feet tall, from a stout rootstock bearing several subglobose, scaly, white bulbs. 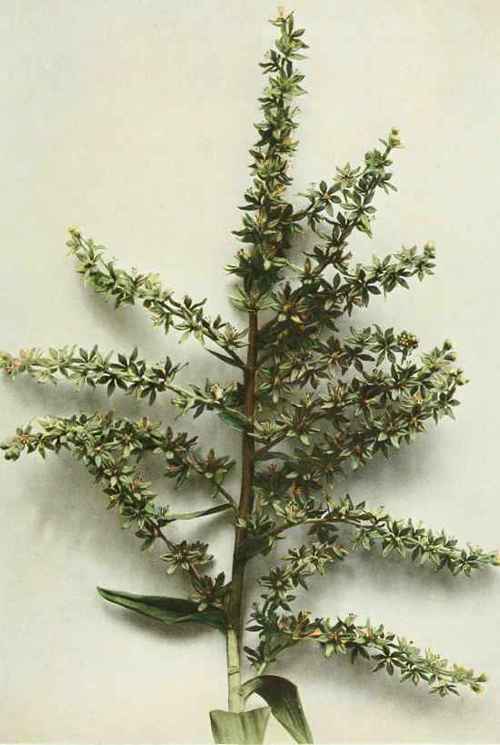 Leaves in whorls of four to ten or some of them alternate, lanceolate or oblong-lanceolate, acuminate, 2 to 6 inches long, one-fourth to 1¼ inches wide, finely roughened on the margins and on the veins beneath. Flowers one to sixteen, nodding on long peduncles at the top of the stem; perianth segments 2 to 3 inches long, yellow or red, usually thickly spotted, recurved or spreading; fruit an oblong, erect capsule 1 to 2 inches long. Common in swamps, moist meadows, and fields. Nova Scotia to Minnesota, Georgia, Alabama and Nebraska. Flowering in July and August. A common and most attractive wild flower of the east, more abundant than the Turk's-cap Lily (Lilium superbum Linnaeus), which has similar but usually larger flowers, usually orange-red and purple-spotted, more strongly recurved flower segments and leaves smooth and not roughened on the margins or veins as in L. canadense.